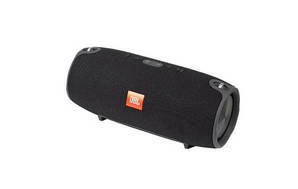 Snapshot: The JBL Xtreme has a battery with below-average runtime. It is very heavy, and can't connect to WiFi. Has a 3.5mm line input. Sound (45%): Scored by our panel of expert listeners judging a variety of music, spoken word, and other sounds on each device and scoring them out of 10. These scores are collated to get our overall sound score. Ease of use (45%): Considers the clarity and accuracy of the manuals supplied and the ease of setting up the speaker, as well as connecting it to a device and sending music to the speaker. Signal (10%): Tested by looking at several factors, including having the audio source in different positions, using various audio sources, interference, obstruction and degradation. Price is based on a March 2019 survey.